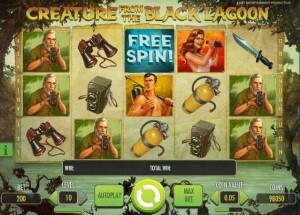 iGame Casino :: Creature from the Black Lagoon™ video slot - PLAY NOW! Creature from the Black Lagoon™, Net Entertainment’s new monster video slot in cooperation with Universal©, is a 5-reel, 3-row 20-line video slot awash with features. Maximise wins with Wild substitutions, Spreading Wilds, Sticky Wilds, Free Spins, and Re-Spins. The prehistoric, half-fish, half-human Creature makes his appearance in Free Spins, capturing Kay and taking her to his underwater lair. Players get the chance to rescue Kay- when the target symbol and the Creature appear, the Creature gets shot. The more target symbols collected, the more the Creature’s health deteriorates and the bigger the reward – unlock Spreading Wilds and re-spins. Reach the maximum amount of collected target symbols and unlock 10 additional Free Spins! Creature from the Black Lagoon™ :: You can try this NEW Slot game right now at the following casinos: iGame Casino, Monte-Carlo Casino, Jetbull Casino, Unibet Casino, Vera & John Casino, ComeOn Casino, Mr.Green Casino, EuroSlots Casino and RedBet Casino.